Written by: Malone on July 9, 2013. I approach anything with the WWE Studios logo emblazoned upon it with a fair bit of caution. ”The Marine “, “12 Rounds ” and “See No Evil ” are just a few examples of watchable stinkers the studio has put out over the years. The key word here is “watchable”. I’m not expecting John Cena playing “Hamlet “, but I will get mindless fun albeit with a fair share of eye rolls and guffaws. But imagine my surprise to see that WWE’s latest, “Dead Man Down “, available on Blu-Ray and DVD July 9th from Sony Pictures Home Entertainment, reunited “The Girl with the Dragon Tattoo ” (original) director Niels Arden Olpev and his leading lady Noomi Rapace. It looks like this picture comes from excellent stock… and with nary a trace of HGH to be found in the cast. Could it be? Could WWE finally be putting out quality films? It’s possible. ”Dead Man Down ” is a neo-noir that revolves around New York’s criminal underworld and Victor (Colin Farrell), the professional killer at the center of it all. 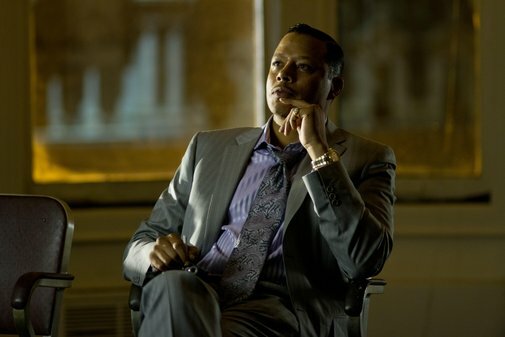 After saving the life of his boss, Alphonse Hoyt (Terrence Howard), he finds himself to be the capo’s right hand man. However, everything he has is about to be put in jeopardy. After Victor’s disfigured (yet still insanely gorgeous) neighbor Beatrice (Rapace) witnesses him killing a man, she blackmails him into pulling off a hit for her: revenge on the drunk driver who destroyed her life. Unwilling to kill her, he agrees to play ball and soon their mutual desire for retribution leads to a twisted romance and a plan for the ultimate vengeance. Victor (Farrell) and Beatrice (Rapace) are out for revenge. With a script written by J.H. Wyman (executive producer and co-showrunner of “Fringe “) and Olpev directing, you’d think you’re in for a dark, hard-boiled crime film and you’re right, sort of. It’s certainly dark… and I mean that literally. The color palette seems to have been made up exclusively of black, puke green, brown and steely blue – it’s like spending 2 hours in Pittsburgh during the winter. As a crime movie, this is grittier than this summer’s “Fast & Furious 6 “, but with similar ridiculous plot twists and convenient logic lapses to keep the story going in whichever direction the filmmakers want it to go. This seems to be an ongoing trend lately in American movies, they work through 75% of it and fudge the rest. It could be the WWE association, but I can just imagine the production meetings being like this: “Brah, he’s a pro. Wouldn’t he just kill her?” ”No way, Bro. If he did, there wouldn’t be a movie, would there?” ”Oh, yeah. Good point!” It’s as if the filmmakers think the audiences aren’t going to question it… and sadly, they’re probably right. These films are meant to be seen on autopilot. The moment your brain engages, the whole thing crashes into the mountain. Alphonse Hoyt (Howard) controls the game. Or does he? The performances are really good and there is enough talent to distract from the fact that Colin Farrell is using a fake American accent to cover up a fake Hungarian accent to cover up his real Irish accent. Terrence Howard does a bang up job, per usual and Noomi Rapace is just a joy to watch. F. Murray Abraham and Armand Assante also make welcomed, but brief appearances. The directing is adequate. Olpev can get a performance out of an actor, but the film’s awkward pacing combined with the script’s facepalm moments lead me to believe he can’t always see the forest through the trees. As far as the Blu-Ray is concerned, this is a beautiful disc. 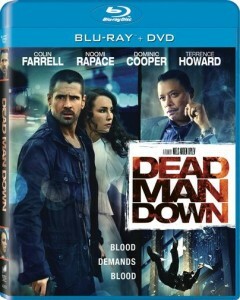 Now, I can’t say I’ve ever had an issue with Sony’s picture quality, and “Dead Man Down ” was given a top-notch transfer. That said, I found that the image could often be so dark that it would blot out some of the detail. Case in point: the scenes where Victor talks to Beatrice on the phone out on his balcony. In the darkness I could see some weird webbing or grid… maybe a reflection of some sort on my TV screen? Nope, just bricks from the exterior of his apartment engulfed in one of many unnecessary pools of black. I have no idea how the film looked in the theater, but my guess is the picture’s darkness was by choice of the cinematographer and has little to do with the Blu-Ray specifically. The 5.1 DTS HD-MA soundtrack is flawless. Rainfall, bullets and crashes take full spatial advantage of the surround. Dialogue is clean and clear. There are three featurettes in the special features section: ”Revenge and Redemption: Crafting ‘Dead Man Down’”, “Revenge Technique: The Cinematography” and “Staging the Action: The Firefight”. There are also previews for a handful of upcoming Sony releases, but not one for the feature itself.